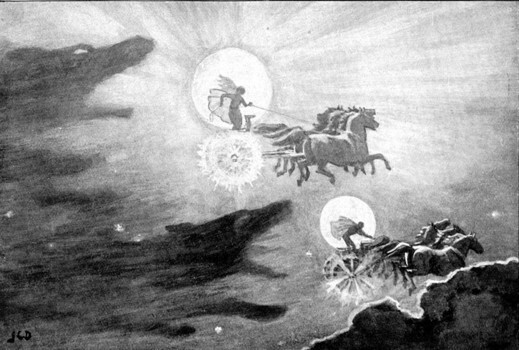 The Norse Sun & Moon had shelf lives where the sky wolves would eventually catch up and devour them, signifying the end of Time. The most miniscule of heavenly bodies is by far the biggest and brightest one seen from Earth’s evening sky. The tiniest sized among all the space rocks and gas ball giants has by far the most direct, causal effect on Planet Earth in numerous ways, the most obvious being the oceans’ tides. Modern Astrology incorporates many theories from various Eastern and Western schools of thought. I personally feel within the heart of this esoteric study of the Heavens, one philosophical tenet stands at its core – the Zen Buddhist principle of Yin & Yang, which is also known as The Law of Duality, The Theory of Juxtaposition, etc. This system of thought believes that everything in the Universe is juxtaposed or has a polar opposite force of equal power. When these polar opposite forces of an inherently equal nature are joined together, a state of Balance is achieved. As a person increases in consciousness, the state of Balance created by the union of polar opposites eventually evolves into a heightened sense of spiritual awareness, upon realizing that all things are connectedly One. The Law of Duality can be individually applied as well, by observing the simultaneous effects of Yin & Yang flowing within a single, solitary entity, as shown by the juxtaposing descriptions of The Moon which began this piece. As we soon shall see, the Moon’s dualistic aspects play a highly significant role with Norway’s mass murders. By analyzing the Moon’s juxtaposing influences and applying them specifically to the cultural atmosphere of 21st century Norway, a more linear perspective can be given in the days and months leading to July 22nd, versus everyone being left in a state of confused shock over events of such a disturbing nature occurring in a country as quaint as Norway, the place where the Nobel Peace Prize is distributed. Conversely, by stepping back from The Moon’s duality, the world must mark and pay heed to the karmic significance that lies within Norway’s Day of Discord by re-evaluating our limited or stilted perceptions of global terror in the time preceding July 22nd, so that our newer, starkly changed viewpoints will help us move forward into the future as a more unified, societal whole. With that said, the future cannot be remotely altered unless we delve far into the reaches of humanity’s Past as well. Among the vast majority of mythologies of ancient cultures, the Sun represented the archetype of masculine energy and the Moon, feminine. This was not the case with the Old Norse myths. The roles were reversed. Like Apollo and Artemis from ancient Greece, the Norse gods of the Sun and Moon were brother and sister, but their domains were juxtaposed. The Sun, or “Sister Sun” was ruled by the goddess Sol and The Moon was ruled by her brother, Mani, “The Man On The Moon”. Whereas your standard god or goddess showed distinction from humanity by possessing transformational powers or by being descendants of a divine race or bloodline, The Norse Sun & Moon gods were mortals who by circumstance, ended up being tossed into the heavens and assigned jobs that were beyond stressful. Unlike the poser Solar and Lunar big guns from other cultures that barely broke a sweat while they were sky riding their chariots, whenever Sol and Mani did their obligatory job of causing night and day, the siblings faced life threatening pursuit from 2 menacing, saliva dripping, huge fanged sky wolves (see article’s picture). Mani’s wolf was the more powerful of the 2 and would regularly take huge chunks out of his Chariot (the waxing and waning of The Moon) before the nighttime god managed to pump the lunar pedal to the metal and escape just as his sister began embarking on her own perilous trek across the Earth’s sky. The Pantheon of deities from most mythologies were comprised of immortal beings. Sol and Mani knew they had a shelf life. The Norse gods of the Sun and Moon were well aware a day would come when they would both be overtaken and annihilated by the 2 deadly beasts that threatened their daily journey. The day the wolves devoured the brother and sister already had a name – “Ragnorok”: The Destruction of Creation & The End Of Time. The ancient Norse people had an inherent awareness that daily existence always had elements of danger that constituted Life itself, and that no one and nothing were completely safe….not even The Sun or The Moon. Many don’t realize that Astrology is a study of the various heavenly bodies of the Cosmos, as seen from the perspective of being on the Earth’s surface. We all know that everything in the Solar System revolves around The Sun, but when considering things from the angle of looking up at the vast sky from the surface of planet Earth, The Sun & Moon are very much equals, many times with the Moon bearing a substantially larger presence in the Heavens than the mighty Solar fire ball. Granted, one’s horoscope is based on one’s Sun sign, or the sign the Sun was placed in on the day of one’s birth, but astrologically, the predominance of a person’s overall personality is comprised of 3 things, each having an equal amount of significance and influence: The Sun, The Ascendant (Rising Sign), and of course, the Moon. Because of its foundational prominence in the astrological template of the psyche of Man, The Moon, the sign it rules over, Cancer, and The House it oversees, The 4th, rule over those particular things that I, your first of a kind theory making astrologer, have termed “that which makes us human” – Emotion(s), the Past, one’s Home, one’s Childhood, one’s Parents (Nurturers) – especially one’s Mother, a goodly portion of that which is Subconscious (Neptune & Pluto rule over the remainder), our dreams, along with anything which provides us with a sense of security. From a societal perspective, the Moon deals with that which makes us feel a part of “our people” by ruling over such things as one’s Heritage, one’s Bloodline, one’s Cultural Identity or Nationality, and lastly, one’s sense of Patriotism. It’s no coincidence that the Planet which rules over the Mother rules over the Motherland as well, since we relate to both from such a core, emotional level. I only recently expanded upon the astrological association of America’s Holiday of displayed Patriotism occurring not only during the time of the Moon ruled sign of Cancer, but its actual date of July 4th does as well, since Cancer is the 4th sign of the Zodiac and the Moon is the ruler of the 4th House. Having some of the most rugged coastline in the world as well as a winter season that brings subArctic temperatures (the lowest recorded being 60 below zero) and in some parts of the country, “Polar Night” (where the Sun never rises) during most of the month of December, it’s no shocker that Norway is astrologically deemed to be ruled by the sign of the survivor who can outlast everyone else with just the bare minimum of necessities, Scorpio. Scorpionic people feel things to the depths of their emotional core. However, with that said, the Scorpionic person would rather impale themselves in the face with an ice pik than have any of their emotions be displayed in public, the experience is THAT private and personally intense for them. Because of this awareness of their emotional depths, Scorpionic people come across as rather stoic to others, dare I Norway say, emotionless. Scorpionic people also have a tendency to possess the very amusing mindset of a fixed sign nature which actually thinks they have control over all aspects of Life…..
God bless ’em for trying, is all I’ll say to that last one. Coming from the northern lands of ice and snow that during the winter months have some of the coldest temperatures and heaviest snowfall on the globe, it’s understandable Norway’s ancestors saw even The Night and The Day having to worry about the possible pitfalls of a treacherous daily existence. But it was precisely this Scorpionic approach to life which allowed the early Norse people to not only survive, but thrive in their world of extreme harshness. Inheriting the stoic Scorpionic survival instincts of their Norse ancestors, modern Scandinavian culture as a societal whole tends to have environments that are streamlined for functionality and frill-less efficiency, (case in point, anything from the Swedish company, IKEA), and their cultural approach to these environments tends to be one of minimal emotions and maximum control. The United States of Leifica? That Columbus guy may have gotten all the glory, but a Norseman set foot on the North American continent practically 5 full centuries earlier, when Viking Leif Eriksson set sail from Norway, visited Greenland, and landed on the coast of what is now called Newfoundland in modern day Canada in the year 1002. Now why don’t we hear modern day Scandinavians making a big Ragnorok-like rucus over this barely known fact like the Italian Americans were doing when there was the threat of Columbus Day being demoted due to the current perspective of Columbus’ discovery of America being the official start of slavery, etc. Remember the whole “not displaying emotions in public” societal thing? Homogeny – (noun) from Greek “Homogeneia”, similarity in structure of individuals or parts because of common ancestry, a community of origin. Quotes given by 2 survivors of the mass shootings of Utoya Island on July 22nd. Keeping in mind everything that has been discussed so far about the astrological Moon and the origins of Scandinavian culture, the modern view of Norway by its people and by the rest of the world had become homogenized, for better or worse. Before July 22nd, the world, including Norwegians themselves, held the homogenized belief their pragmatic, non-reactive culture could never yield a mass murderer the likes of Anders Behring Breivik. As we shall see in Part III, it was precisely because of Breivik’s extremely warped version of The Homogenized Moon of Modern Norway that the devastating events of July 22nd came to pass. In Part III, Brad interprets Oslo’s chart for the fated day of July 22nd and shows how the Heavens reflected the events on Earth with a bone chilling literalness.